It’s well known that the royal family have quite a few rules and regulations. Everyone in the household is required to follow suit and step in line – especially when on royal business or when representing the monarchy at events. Although Kate had a lot to learn when she married William, the young Duchess has been quickly picking up hints and tips along the way. Her main source of wisdom and knowledge? The Queen herself! Queen style tip number 1 – Wedges are a royal fashion faux-pas! A source told Vanity Fair: ‘The Queen isn’t a fan of wedge shoes… she really doesn’t like them and it’s well known among the women in the family.’ So after Kate was seen out on her last royal tour in summery wedges, the Queen obviously stepped in, and Kate hadn’t been seen in wedges since – until this weekend! Instead of following in the Queen’s footsteps, opting for sensible, stylish, courts as usual, Kate stepped out in a pair of wedge shoes from high-street retailer Monsoon. She wore the comfy alternative to heels on the first day of her royal tour of India and Bhutan with Prince William, when the couple joined a game of cricket at Mumbai’s iconic recreation ground with a local cricket academy. Although the Queen might not be too happy to see Kate wearing wedges again, the Duchess of Cambridge should be commended for running, jumping, and playing cricket in 6-inch heels – all without so much as a wobble! You go Kate! 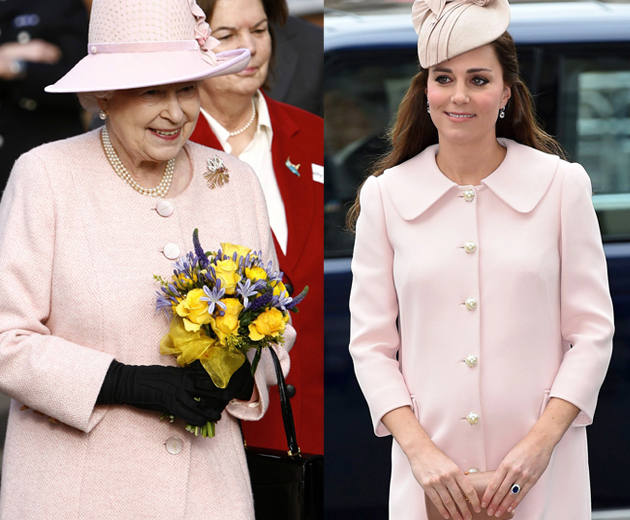 Queen style tip number 2 – one should always colour coordinate For the Queen, colour coordination is key. She has taught Kate to always match your hat to your coat, and if possible your dress too, for a complete outfit of matching elegance. Queen style tip number 3 – weigh your skirts down After Kate was caught out by a strong gust of wind, the Queen shared with her one of her top fashion tricks. The Queen avoids such moments of embarrassment by sewing small weights into the bottom of her skirts. So even if the wind does strike, her skirt will stay in place. Kate hasn’t had any Marilyn moments since. Queen style tip number 4 – one must always wear a hat And a good, eye catching one at that! 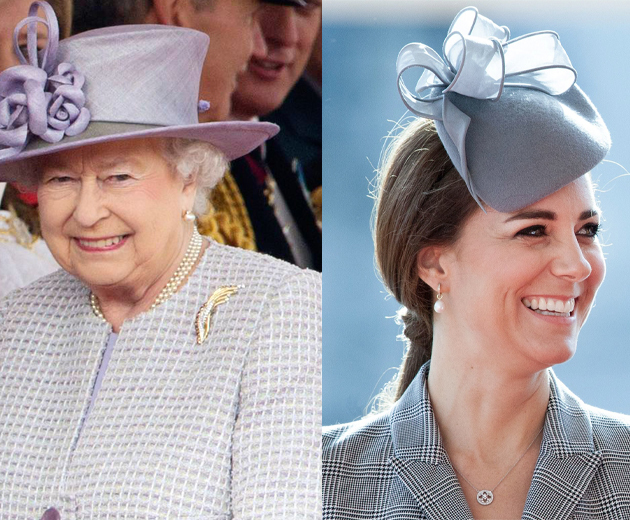 Kate follows one of the Queen’s simplest style rules – at formal occasions, hats are a must! Queen style tip number 5 – match your clothes to your event The Queen likes to add personal touches to everything she wears. Like other members of the royal family, she has advised Kate to do the same. Dutifully, Kate always tries to follow suit. Such as the Strathearn tartan scarf she took with her to Edinburgh. Or, her references to the iconic, unofficial emblem of New Zealand in her hat and brooch when she visited in the above blue dress. The Duchess also took this advice from the Queen during the official royal visit to Canada in September 2016. Wearing a red dress to a state banquet as a nod to the colours of the country’s national flag, Kate also accessorised as advised by the Queen. She wore a Canadian Maple Leaf brooch, a nod to the host country’s most widely recognized national symbol, pinned to her dress. The brooch was actually lent to Kate by the Queen, who inherited it, as it was originally the Queen Mother’s. The Queen knows that a complete outfit is so much more than the dress. However, when it comes to accessories, she also knows that less is most definitely more! For years and years the Queen has kept her accessories simple. Taking after the Queen, Kate now accessories her evening gowns with elegant earrings to complete her look (and the occasional pearl necklace). Queen style tip number 7 – wear a belt From a young age, the Queen knew that a long, belted frock was a wardrobe must-have for any Royal. Kate has promptly followed suit! 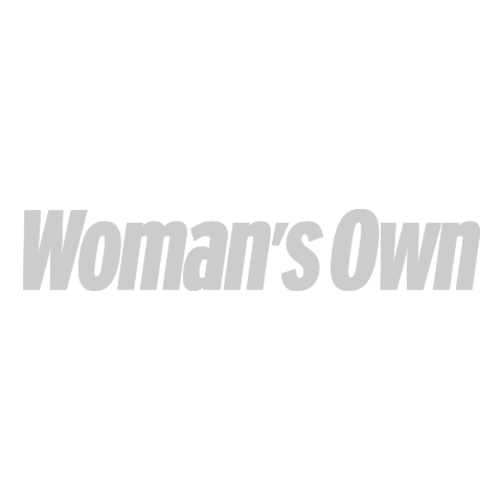 Queen style tip number 8 – stick to what works! The Queen knows what works for her, and she sticks to her statement style. She has had the same handbag for years, just in many different shades. She has also worked with the same stylist for years. Kate has learnt this, and now works with the same stylist on a full time basis. She even got her stylist to work her magic on Prince William! The Duchess also now has a handful of tried and tested designers she knows look good on her. So she sticks with them! Such as this Jenny Packham dress she wore both for her first royal appearance in 2014 and to a ball in New York in 2015. Queen style tip number 9 – if in doubt, copy me! 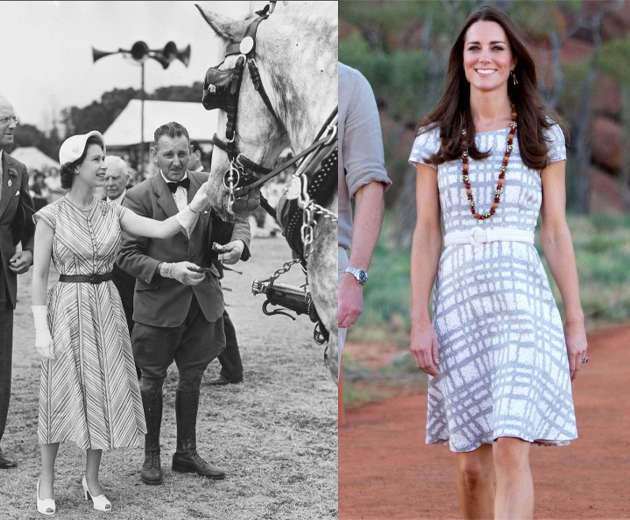 When the Duchess of Cambridge isn’t taking style tips from the Queen, she uses our Monarch for simple outfit inspiration! 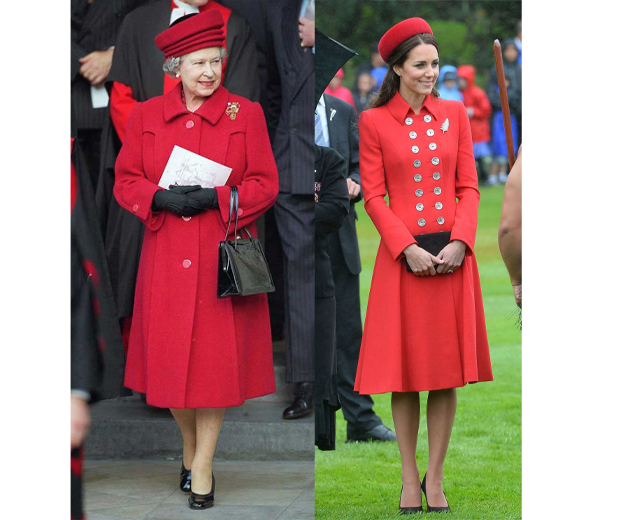 We love Kate’s smart red coat and hat combo. Plus the classic black court shoe – as worn by Her Majesty for decades! 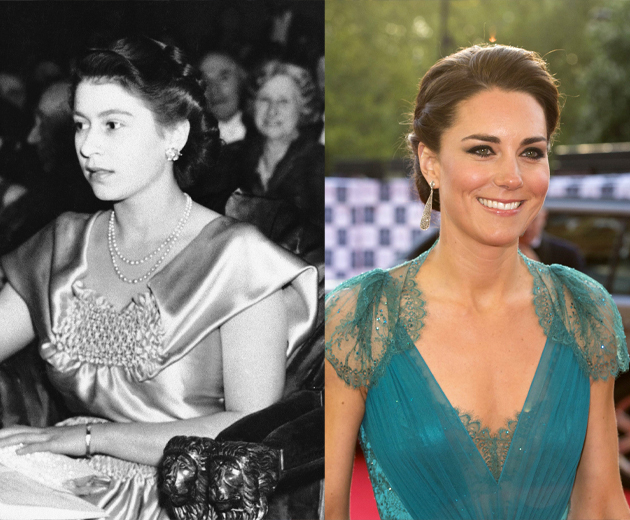 You can’t deny that both Kate and the Queen have had their fair share of scene-stealing style moments!